← I have to eat carbs, right? Are my food issues turning my kids into junk food junkies? I was born in 1971 to vegetarian hippie parents. We moved to a tiny village in Vermont when I was 4. Mom and Dad grew their own food in the garden, composted our leftovers and refused to take me to McDonalds. They forbade candy for years, but eventually relented and designated Friday as “Candy Day.” By then I was in grade school and my younger sister and I would get to go to the local general store on Friday afternoon to pick out a treat. I would stand in front of the candy display racked with anxiety….what should I choose? The Charleston Chew (big, chocolate and chewy), a pack of gum (long lasting), or a package of Necco wafers (variety of flavors)? By the time I made my decision I was exhausted, and next Friday seemed like an eternity. When I was diagnosed with type 1 diabetes at 14 years old, it seemed like the punishing Gods had been watching. I’d left home that year and was living at a private boarding school. Away from my parent’s watchful eyes, I’d been indulging in Cherry Cokes, Sugar Babies, Chocolate milkshakes and Reese Pieces. I didn’t seem to notice that while I was gorging on sugary food, I was losing an enormous amount of weight. By the time I arrived at the school infirmary, I’d lost 15 pounds in 5 days. The school nurse called my mom who came to pick me up and took me to my pediatrician who diagnosed me with type 1 diabetes. The first question I asked was, “does this mean I can’t play sports?” (I really liked the green and white kilt I wore for field hockey). The second question was “Does this mean I can’t drink Cherry Coke?” Of course I couldn’t drink Cherry Coke. I could drink tea and water. When I returned to school I watched as my friends drank Cherry Cokes and ate Sugar Babies, slipping them one by one into their mouths during English class, while I drank water. I was salivating on the inside. I no longer drool over my friend’s snacks (most of my 40 year old mom friends are vegan or low carbers), I now drool over the food I feed my boys. My three boys love crackers, chips, pretzels, bread: peanut butter and jelly sandwiches, bagels with cream cheese, grilled cheeses, and turkey subs, pancakes, waffles, cereal, chocolate chip cookies and ice cream cakes. (I feel a Shel Silverstein poem coming on.) And while they snack on a box of Cheeze-its, I eat nuts. I stand at the kitchen counter while the maple syrup drips down their chin, and resist poking a fork into the remaining pancake on their plate. But I’m the one who shops for them and cooks for them. I’m the one who says yes to juice boxes and granola bars. 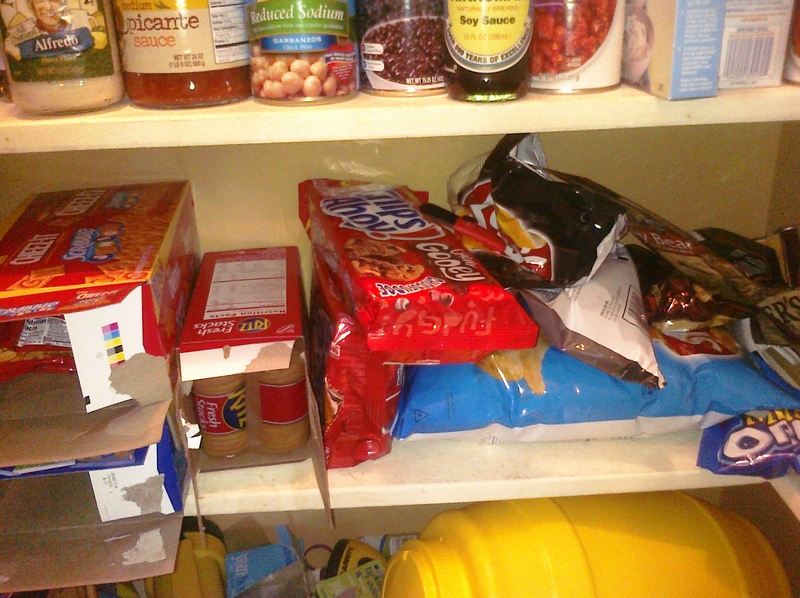 I’m the one who fills our pantry with processed foods. I’m the one who says no to myself and yes to my boys. But what does that mean? I used to always say that after my own upbringing I didn’t want to have food=restrictions. I wanted to say yes to my boys because I remembered how deprived I felt and how as soon as my parents were out of the picture, I satisfied all of my food desires and more. And how after I was diagnosed, I had to learn how to restrict myself on a daily basis. As a parent I cook home made meals for my boys and give them their fruits and vegetables, but I also pack their lunchboxes with processed foods. And while I try not to blame diabetes for everything in my life (wink, wink), I do wonder if I serve my kids the foods I can’t eat. This entry was tagged Chronic Illness, diabetes, food, motherhood, parenting. Bookmark the permalink.